Through a major grant from the Denver Foundation, The ACADIA Project is in its second year! The Aurora Cultural Arts District (ACAD) has convened two partners - ‘FAX Aurora and Community Enterprise Development Services, to develop The ACADIA Project (TAP). This program identifies and engages refugee and immigrant artists in Aurora, providing assistance so they can build creative businesses to market and sell their crafts. We are working on raising additional funds to help fully realize this new project. If you'd like to contribute please click the donation button below. 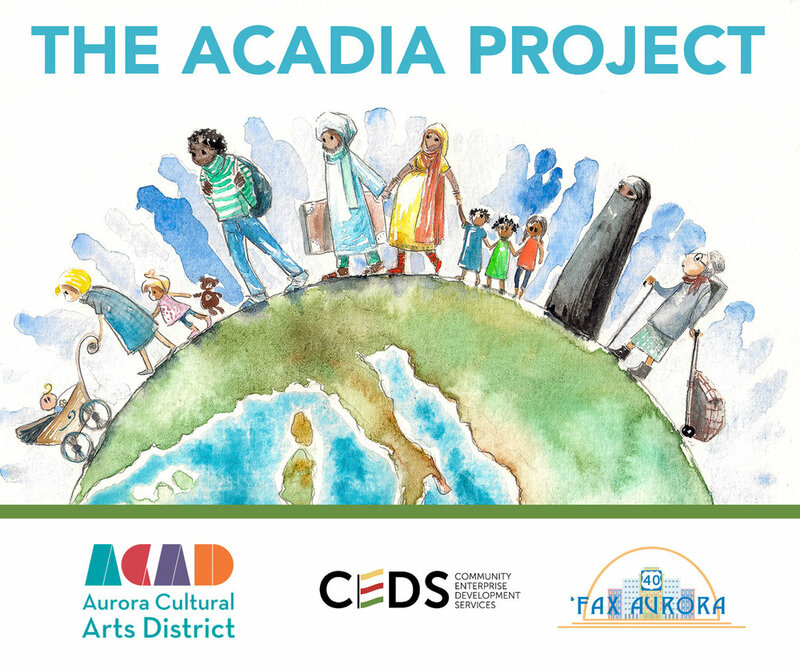 The Aurora Cultural Arts District (ACAD) has convened two additional partners - ‘Fax Aurora and Community Enterprise Development Services (CEDS), to develop The ACADIA Project (TAP). This exciting new program identifies and engages refugee and immigrant artists in Aurora and provides assistance to them in building their creative businesses to market and sell their works. This program is open to artists working in the visual arts, culinary fields, makers and other creative endeavors. As part of this program artists and creatives will receive free mentoring, marketing and portfolio workshops, access to financing, display space and help presenting their work to American buyers. The majority of program activities will be located in the Aurora Cultural Arts District, along the Colfax Corridor. This area is among the most culturally diverse areas in Colorado, with nearly 40% of the adult population identifying as foreign born. 136 languages are spoken in Aurora’s public school system and communities. These refugees and immigrants bring with them a set of artistic skills and abilities that are easily transferrable to America, where they find a ready audience that seeks out unique artistic expression. The target area has high levels of poverty, 43% of families living below the poverty line; therefore, assisting newly arrived individuals with developing their artistic endeavors addresses economic challenges, ensures the success of the local community and diversifies the local art scene. The idea for the program was borne from community conversations with over 18 partners in early 2015. These groups desired more engagement with our refugee and immigrant neighbors, varied approaches to economic development and support for these groups. ACAD, CEDS and ‘Fax Aurora collectively bring unique skill-sets and relationships to ensure the success of TAP. ACAD brings their experience in building creative businesses and supporting local artists. ‘Fax Aurora contributes a wealth of relationships with small business owners and business experts in the target market. CEDS will identify refugee and immigrant artists and will consider program participants for micro-loans to build or expand their business.